Right this whole blog thing can be quite fun so I’m going to get into it. Here’s a little update on what to expect from me soon. I’m speaking at this event after the March 26th march. There are still a few standing tickets left if you’d like to indulge in me chatting away, or alternatively if you’d like to laugh for an extended period of time at the hands of Josie Long’s wit, or perhaps if you’d like to listen to the rhythmic spoken words of Dan le Sac vs. Scroobius Pip. If you do come along then make sure you say hi! On a similar, although less self-involved pluggy note (although if I can’t be self-involved on my self-titled blog then when can I be?) 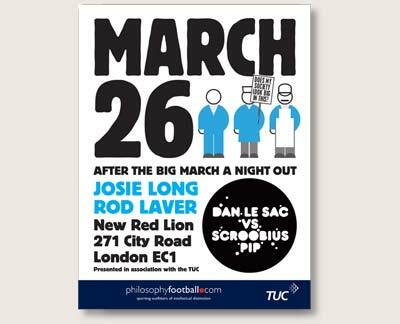 please do also come along to the march on March 26th because it’s a national march against the cuts and if enough of us show up the government HAS to listen. Even if you’ve never been involved before, this is the perfect place to start. And invite everyone; if I can be politicised and mobilised then the possibilities are endless, really. There’s also a march to save education tomorrow – assemble at 12pm outside UCL for a 2pm picket in Tavistock Square. This one is aimed at management of universities in general (who will be conveniently gathered for some regular and no doubt excessive meeting of corrupt minds) and we will be putting pressure on them not to raise the fees just because the government says they can. I will eventually tell you all about being backstage at Sukey HQ, definitely before the techies work their magic and improve police/student relations at what would otherwise be another poorly-portrayed protest that then won’t be portrayed at all by the media. I will also eventually finish off my nice but not-so-little overview on the use of twitter at the UCL Occupation and the student movement in general. You all know how personally attached I am to this whole situation so it’s emotional to write; bear with me! At the moment I’ve just finished having a wonderfully incongruous time at London Fashion Week, largely due to the generosity of Glam UK and of course due to the company of fashionistas and the constant eye-candy of clothes and models. I will be posting a few show-specific reports and awful photos to The Real Runway in coming days that I’ll kindly link you to, and I may post a little diary of my week on here so that this doesn’t get too politics heavy. Then expect the same in a few weeks after Paris Fashion Week. Oh and I’ll update my media section soon, more for my benefit than yours. That’s two posts in as many days – I’m treating you all so well! Don’t expect any more for a while now… Luckily you can keep overly updated on my oh-so-interesting triple life on my stream of consciousness lovingly hosted by twitter.